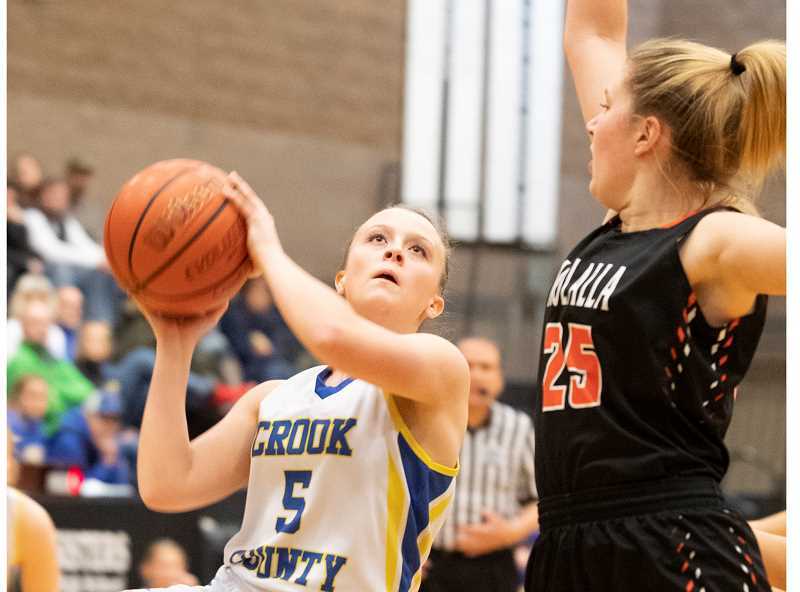 The Crook County Cowgirls struggled with consistency at the Sisters Holiday Tournament. The Cowgirls played solid basketball at times but were unable to maintain their momentum as they went 0-3 at the tournament, which was held last Thursday through Saturday in Sisters. "We go from moments of brilliance to where they don't even do anything," Crook County head coach Heidi Lea said following the tournament. "That's what is killing us. We had a fast break that you would have gone wow, and then we had a couple times down that we tried to dribble and lost the ball. We go from moments of brilliance to going back to the drawing board." The Cowgirls opened the tournament with a 48-30 loss to the Molalla Indians on Thursday. Crook County struggled again on Friday as they fell 62-31 to the Henley Hornets. Saturday, Crook County led for portions of the game, but a slow third quarter proved costly as the Cowgirls fell 44-35 to the Estacada Rangers. In Thursday's tournament opener, the Cowgirls went toe-to-toe with the Indians for the opening quarter. However, the Cowgirls went cold in the second period as the Indians stretched an 11-9 first quarter lead into a 20-11 halftime advantage. Molalla poured it on in the third quarter, putting the game out of reach as they outscored Crook County 17-4 to extend their lead to 37-15. Crook County played better the final period, outscoring Molalla 15-11, but it was too little, too late as the Cowgirls went down to defeat. Teagan Freeman led Crook County in scoring with 11, while Liz Barker added six points and nine rebounds. Zoe Wood and Kaityn Curry led Molalla in scoring with 10 and 11 points, respectively. Friday, Crook County was never in the game. Henley's Jessica Northcutt came out on fire to open the game, hitting a pair of three-pointers and a layin in the first two minutes of the contest as Henley roared out to an 8-0 lead. Crook County played even the rest of the quarter but still trailed 18-12 at the end of the period. Henley increased their defensive pressure in the second quarter, outscoring the Cowgirls 12-1 as they took control of the game. The Hornets continued to stretch their lead the remainder of the contest as they cruised to the easy victory. "They can really shoot the ball," Lea said of the Hornets. "They are a solid team." Northcutt finished with 17 points for the Hornets, while Braidy Smith was also in double-figures with 14. Crook County was led by Dallas Hutchins with nine, while Freeman finished with seven and Josie Kasberger chipped in with six. The Cowgirls started slowly again Saturday afternoon against the Rangers as Estacada ran out to a 10-5 first-quarter lead. However, Crook County came roaring back in the second period, outscoring the Rangers 12-6 as they took a 17-16 lead into the locker room at the half. Crook County came out sluggish once again to start the second half as the Rangers jumped on top, outscoring the Cowgirls 14-5 in the period to take a 30-22 lead. "We allowed one girl to hit a pair of threes and they were up by five," Lea said. "Then, another girl hit a three and it's nine. If you don't do something to respond, it gets out of control, but truthfully, we shot ourselves in the foot." Crook County outscored Estacada 14-13 in the fourth quarter, but the damage had already been done. Still, the Cowgirls had plenty of opportunity to win the game. Estacada's aggressive defense led to several Crook County turnovers, but it also led to Ranger fouls. Unfortunately, the Cowgirls were unable to capitalize as they went just 14-35 from the free throw-line in the game. "We actually shot 35 free throws, and we only made 14," Lea said. "That killed us. I said, 'Girls, if you had just made 10 of those 21 you missed, we would have won by one.' When you miss 21 free throws, you can't expect to win that kind of game." Hutchins and Barker each had seven points to lead the Cowgirls in scoring. 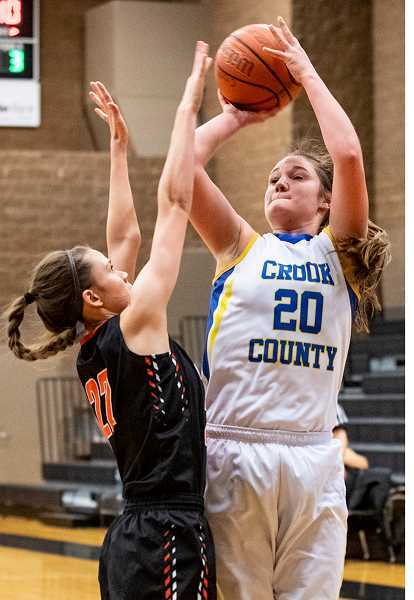 Hutchins added 15 rebounds, while Barker pulled down 12, and Kasberger grabbed 11 as Crook County outrebounded Estacada 57-35. Estacada was led by Makaelyn Jennings with 12 and Isabelle Hagel with 14. Hagel also pulled down 10 rebounds for the Rangers. "Our girls are playing hard," Lea said. "And we are scoring points, which last year was a struggle. We just have to step up on the defensive end and try to hold them to less than what we are doing right now, but the girls are showing up and playing and that's what we want them to do." Estacada and Crook County have a rematch on Saturday, Jan. 5 as the Cowgirls (1-9) travel to Estacada (1-8) for a 5:30 p.m. game. Crook County returns home on Tuesday, Jan. 8 to play Cottage Grove (5-6) in a 7 p.m. game. The team then opens Intermountain Conference play on Friday, Jan. 11 when they go on the road to take on The Dalles (5-5) in the league opener for both teams. Crook County — Teagan Freeman 11, Barker 7, Mode 4, Woodward 3, Kasberger 3, Rash 2, Hutchins, Ptomey, Ramos, Papke, McClellan, Ossenkop. Totals: 12 2-8 30. Molalla — Kaityn Curry 11, Wood 10, Parker 7, Fincher 6, Greer 5, Nelzen 4, Nacoste 3, Nogle 2, Lisac, Burge. Totals: 20 5-13 48. Three-point goal — Crook County: Freeman 3, Woodward. Molalla: Parker, Nacoste, Wood. Crook County — Hutchins 9, Freeman 7, Kasberger 6, Barker 3, Papke 2, Brooks 2, Mode 1, Rash 1, Guthrie, Woodward, Ptomey, Ramos. Totals: 12 5-10 31.
Henley — Jessica Northcutt 17, Smith 14, Loney 9, McLauchin 6, Moore 5, Lowry 4, Cheyne 3, Sharp 2, Badker 2, Peterson, Barnett. Totals: 24 9-21 62. Three-point goals — Crook County: Freeman, Hutchins. Henley: Loney 2, Smith 2, Cheyne. Crook County — Hutchins 9, Barker 6, Freeman 5, Kasberger 4, Woodward 4, Mode 4, Brooks 3, Guthrie, Ptomey. Totals: 10 14 35 35. Estacada — Isabelle Hagel 14, Jennings 12, Canifax 7, Crombie 4, Youngberg 4, Gipple 1, Lieber 1, Mireless 1, Hawkins, Porter, Burnett. Totals: 14 10-18 44. Three-point goals — Crook County: Freeman. Estacada: Jennings 4, Hagel, Canifax.